“Clean Bright Sharp Resonant Crisp Clear Warm Fat Dirty Bitey Driven Filthy Snarling Barking Brutal Wailing Screaming Tone”. The HT Studio 20 combo is the big brother of our critically acclaimed HT-5 and offers huge versatility for home, rehearsal or studio use. The carefully voiced preamp coupled with a cathode-biased EL34 power amp, provides the user with the ability to create wonderfully lush valve tones through the 12â€ Celestion speaker. I have been looking for this spec for a long time. EL34 based amps are almost always high watts. A pair of EL34’s in Class AB will push 50 watts onwards. Way too loud for my use. Along comes this Dual EL34 parallel Class A amp pushing 20 watts, bingo! That is their strap-line and as far as I am concerned, it is right on the money. 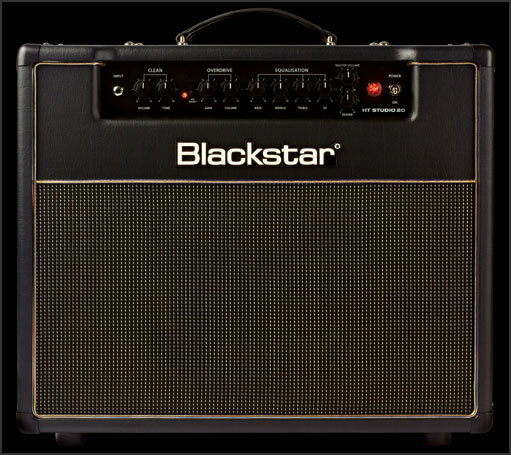 This is one of the best amps I have heard and I have played quite a few. All I need now is reliability and I am keeping this forever. This entry was posted in Gear and tagged Blackstar, Crunch, HT20 Studio, Sound in your head. Bookmark the permalink.